Clark Joseph Kent is a fictional character created by Jerry Siegel and Joe Shuster. A super-powered alien superhero known as Superman who acends to earth from the now-destroyed planet Krypton. Is the superman saga just fiction or a characterization of a reality we once held true? After all it was once widely believed that men were from Mars and women were from Venus. Are there men out there who more closely resemble the constant shifting roles of the briefcase toting, necktie flapping superhuman caring fatherly role model? Are the Clark Kents of yesterday a dying breed? Even the cynical editor of the Daily Planet would have to agree that in times past large numbers of men and women had to juggle their professional identities with family reponsibilities in an effort to save the day on behalf of the family. But what of today? In the mainstream entertainment media of the late 1990's weren't most fathers figures slow, bumbling awkwardly concieved whining idiots so often portrayed in the mainstream entertainment media? In her article, "Undercover Moms" Shellenbarger included a personal comment that would trigger a storm of truth. She said, “It’s been a long time since I’ve seen a dad changing from a suit to soccer shorts in a parked car.” That statement sent a ripple effect across a nation. Suddenly men of all walks of life responded to quickly deflect her reality. A flood of e-mail poured in from dads who spoke of another kind of dad. The responding fathers reported living a life that required something of alter-ego switch. A Clark Kent/Superman mentality. A quick-change routine if you will. After work they find themselves changing roles and clothes “not only in parked cars, says one responder, "but in moving cars, behind dumpsters, in airport lounges, in portable toilets, at highway rest stops and gas stations.” It's not that we think we are super, but rather we're attempting do something very much human and neccessary in order to keep family life in first place." In the eighties and nineties the media made it crystal clear that every stay-at-home mom and working woman was the girl wonder. She took on the roles of dietician, transporter, health care agent, tutor and guide in addition to other roles making it obvious that she was and still is something extraordinary. But now it is becoming evident that the persona of Superman, (the man that does it all) is not so fictiticous either. An interesting article written by the dads at fathers.com says "Some dads started it years ago—leaving work a little early to coach baseball, and scrambling to make the attire match. But today, kids are busier than ever, and more dads are becoming experts at role-juggling as they expand the definition of what it means to be a father." That said, by their own admission, committed fathers acknowledge that they are more often than not the center of their young child's life and at the core of their adult aspirations. Nothing comes close to the deep impressions committed family life makes on our hearts and minds. Deliberately choosing one another bespeaks validation, love and approval. Learning to value family matures us and can thereby help us value life itself. It helps us put things in perspective, humbles us and with some guidance gives us an understanding of our core being no other experience can. "What, is that a pink note hanging from the refrigerator door? Hmmm, Peculiar.... 'Don't forget to meet me and the kids at the recreation center by 6 P.M' Good work Carol. This looks like a job for SuperDad! Quick, to the Dad mobile!" The real Clark Kents have been among us for millenia. It's the science fiction movies and comic books that have had to catch up with that reality and tell our story. A story about ordinary people in the form of hard working mothers and fathers who know how to willingly commit and put their all into their life's work, family. Thanks to all Wonder Women and Super Dads the world over. A tribute to amazing supportive dads everywhere! 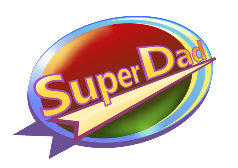 SuperDad greeting cards and gear for your next mission.